Vobis specializes in designing and manufacturing a broad range of different pilot and production crystallizer systems designs to fulfill diverse clients’ and industries’ requirements. We provide the design, engineering, manufacturing, and implementation of complete crystallizer systems, and we have several decades of successful experience necessary to meet our clients’ specific needs throughout their process development through production scale up. As our clients require, we often help them implement pilot evaporator crystallizers and pilot cooling crystallizers to generate crucial scale-up data, and then implement this data in our production-scale crystallizers. The aim of this brief introduction is to provide a bit of information about how these crystallizers work, and how they accomplish our clients’ process goals. Our crystallizers are capable of yielding solids from a vast spectrum of waste and product feed streams; our process solutions enable our clients to cost-effectively reduce waste stream volumes, create landfill-ready solid crystals or produce product crystals, and provide ZLD (Zero Liquid Discharge) processing solutions. We achieve these goals through a variety of processing means. To achieve the client's requested goal, to cost-effectively reducing waste stream volumes, we manufacture single-stage brine pilot crystallizer systems. One of our single-stage pilot crystallizers in some cases constitutes the final step of the client required solution, and in other cases is implemented to produce data which facilitates scale-up design. In the latter case, the data from the single-stage pilot crystallizer is used to design a production-scale single-stage crystallizer, or to design a multiple effect crystallizer (using mechanical or thermal vapor compression, for example) with the goal of improving energy efficiency. Second, creating landfill-ready crystals involves additional specific crystallization processing steps. For many of our crystallizers, feed is concentrated by evaporation, until the saturation point is passed and crystal nucleation begins, during the process of crystallization, the precipitating solids remain suspended in liquid through high pumping velocities. This heavy slurry of crystals and saturated solution is circulated at a high rate within the system also to minimize fouling in the heat exchanger. Crystal growth is promoted to grow the existing crystals, while salt deposition is retarded on the interior of the system chambers. 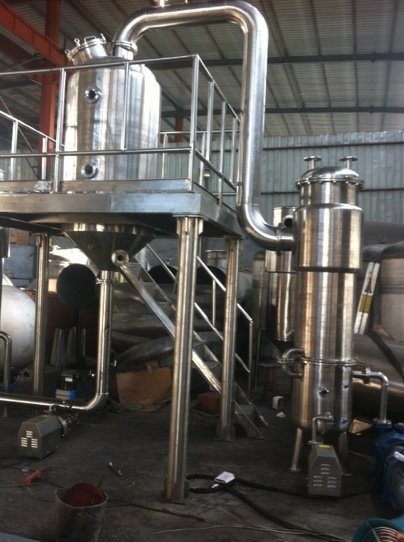 At this stage, a continuous stream of heavy slurry is drawn from the pilot evaporator crystallizer; through continuous or batch centrifugation or a filter press, it is further concentrated into its final, landfill-ready dry crystal form at over 95% solids. Third, Zero Liquid Discharge (ZLD) can be achieved by crystallizing and then drying the crystals for a landfillable solid as dry crystals, and returning distilled water for reuse. First, falling film or forced circulation evaporation processing concentrates the wastewater to the saturation point. Then, crystallization processing is implemented to yield crystals (which can be dried for landfill or pelletized for other uses) and distilled water is produced for reuse, thus eliminating the wastes to realize the goal of zero liquid discharge. Also considered during the design phase of a system, is the range of applications which the client wishes the system to be capable to accommodate as well as the extent the client wants the system’s users to be able to customize the process. The crystallizer design effects the nucleation, crystal size, and crystal yield; considerations and specific concerns such as “what will aid in keeping heat transfer surfaces clean,” also fall into the realm of considerations addressed by the crystallizer design appropriate for the application. This brief informational page is only an introduction to Vobis pilot crystallization systems and we invite your questions. While each Vobis pilot crystallizer involves a client application specific process, the purpose of our pilot crystallizers overall is to generate scaleable data, samples, and operational answers which enable us to design and manufacture full scale production crystallizers, such as a specific capacity multiple effect forced circulation crystallizer. With our crystallizers as with all of our systems, Vobis innovates purpose-driven systems that will enable you to accomplish your process and economic goals. For information regarding our production scale crystallizers, please follow this link.